Mike Castellana has already had two Pro Modified body styles shot down by rulemakers and he's fed up with it. From what we're hearing, his Toyota Solara body style (not legal for Pro Stock) will not be legal under the new non-Pro Stock body rule and he had initially planned to build a late model Mustang Shelby GT but that was given the boot for the 2008 season. From a solid source, we are hearing that Troy Coughlin will be testing his turbo GTO later this month at National Trail Raceway in Columbus, Ohio. If all goes well, Coughlin will bring the car to Rockingham and enter as a Top Sportsman entry. Much has been said about the car's late-model body style and according to the IHRA Pro Modified rules, they will get at least one season to run it. If you're wondering which direction Coughlin will go, we're hearing the 1967 Camaro is high on his list. Mike Castellana confirmed with Torco's CompetitionPlus.com that the Awesome Motorsports team were indeed planning to field a Toyota Solara in 2007. That idea has already reportedly been shot down by the IHRA's tech department before it even began. Castellana was told the body style was unacceptable because it can be easily confused with a Dodge Stratus and the body style is a legal Pro Stock version. That's when the questions immediately began to fly. as over hauling and updating the power plants the team currently has. Read more about REHER-MORRISON PM ENGINES? Sources indicate that defending Top Alcohol Dragster champion Steve "O" Torrence will make his Top Fuel debut at the Torco Nationals hosted my Virginia Motorsports Park. He will be piloting a second Dexter Tuttle dragster. Dodge engines, and the other GM engines. Let the speculation begin. Shannon Jenkins and Mike Castellana were going to build late model cars for the 2007 season. Jenkins was banking on a GTO and Castellana was going to have a Mustang GT. After the IHRA made their adjustment banning Pro Stock legal bodies, the duo planned to run a pair of 1963 Corvettes. Apparently that plan has changed and now Jenkins is reportedly planning to field a brand new Toyota Solara. Even though this car is a late-model, it is legal because the rule stipulates the bodies cannot be legal for Pro Stock. 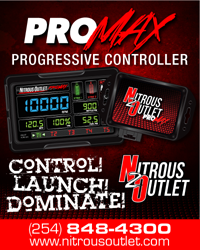 Pro Stock rules mandate that all bodies must be domestic. from Larry Morgan. We'll just have to see how this one plays out. UPDATE - While Krisher confirmed that he has had talks with Morgan, he's elected to remain with his Chevrolet program for 2007. Read more about KRISHER IN A MOPAR? slickest Pro Modifieds to hit the track next year. GLIDDEN AND MASKIN PART WAYS? things. We'll have more on this story as news becomes available. Read more about GLIDDEN AND MASKIN PART WAYS?